A few months ago we reported that China-based AMOLED producer Everdisplay is planning to invest $4.1 billion USD to build a 6-Gen AMOLED factory. 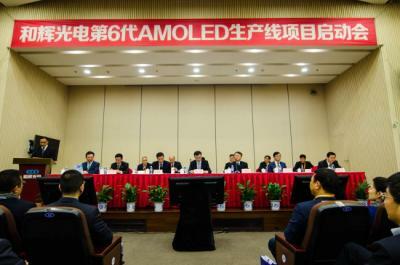 Today the company launched this new AMOLED fab officially in a ceremony in Shanghai, China. On December 9th Everdisplay started constructing the new fab in the Jinshan Industrial Zone in Shanghai. Investment in the new fab, according to EverDisplay, will actually be 27.2 billion yuan - or almost $4 billion USD. The fab will be able to produce 30,000 monthly substrates (1500 x 1850 mm) and will be used to produce small and medium sized flexible AMOLEDs (1 to 15 inch). The fab's construction will take 24 months and EDO will begin installing production equipment in August 2018. Trial production will begin in January 2019 and mass production will only be achieved in 2021. EDO expects to achieve ten billion yuan (almost $1.5 billion USD) in annual sales from this fab. Everdisplay started mass producing 5" 720p AMOLED displays towards the end of 2014 in a 4.5-Gen line with a monthly capacity of 20,000 substrates. Since then the company added more displays - wearable panels and larger 5.5" ones. Everdisplay is also developing flexible panels, transparent panels and high-density AMOLEDs for VR applications. According to reports, Xiaomi's Redmi Pro smartphone uses EDO's (and BOE's) 5.5" FHD AMOLED panels.